What do you know about the power grid or energy transformers? What ACTUALLY happens when you flip on the light switch or go to plug in your phone? The average person is unlikely to know the answer, even less likely are 7-10 year old students… BUT we are SO reliant on the power industry, why don’t we know more? Hyperion Sensors Inc. wants to change the narrative and educate youth by showcasing the exciting possibilities STEM and the power industry has! For the first time EVER, Hyperion Sensors is hosting an event that takes students through a hidden journey, deep inside a Power Transformer, with Professional Engineering Experts on-hand to facilitate the learning process and the newest, coolest innovation in Sensors (#TFITS). National Engineering Month is proud to collaborate with Hyperion as they work toward supporting the next generation of engineers and engineering technologists. By fostering a mentorship culture (their youngest engineering mentee is brilliant 12-year old Ashwin,) Hyperion wants to inspire and keep students interested in engineering through hands-on experiences. Hyperion met Ashwin because he was working on a grade 6 science project and saw an opportunity for third-world countries to purify water by biking and utilizing U.V light. When he built it, there was a tricky hiccup with the ACDC switch. His father reached out to Hyperion because he didn’t have access to the necessary tools or know-how to help. After bringing the bike to Hyperion’s Venture Lab and a few troubleshoots… SUCCESS! “Its so fun to work in that environment where anything goes and everyone is valued,” said Lorena Stellato, Director of Government Affairs and Public Relations at Hyperion Sensors Inc. She is determined to match that same environment at the event! 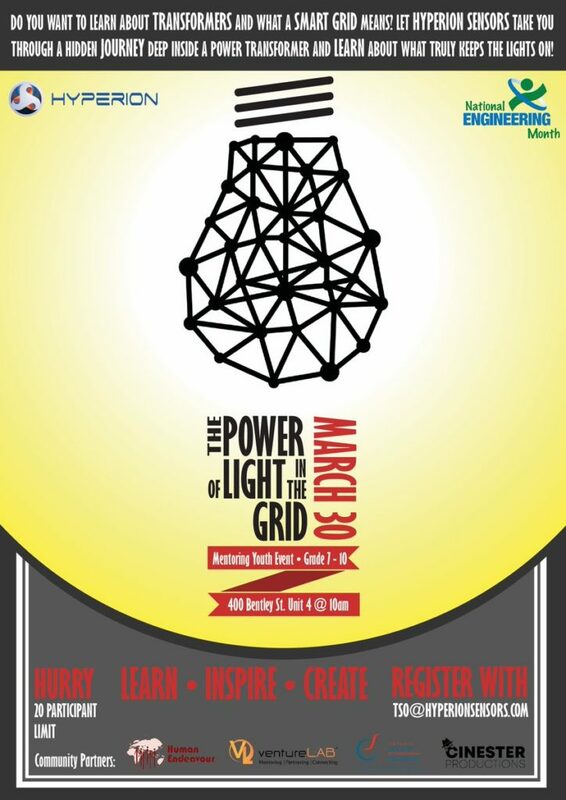 The Power of Light in the Grid event is located at 400 Bentley St.Markham, Ontario L3R 8H6 Canada!